Brown Waxed Sanitary Napkin Bags. Case of 250. Brown waxed bag fits in sanitary napkin receptacles. Helps prevents the spread of disease by enclosing contents. 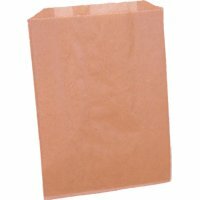 Dimensions: 9.5" L x 7.5" W x 3.25" D.
Go to top of this Brown Waxed Sanitary Napkin Bags. Case of 250. page.